The waterways to the head are rather disturbing. As the drawing is drawn they clear the outside diameter of the liner shoulder, but as the drawing is dimensioned, they are tangential. The 1⁄8″ holes shown would certainly need to be close in order not to be too close to the outside edge. A slightly narrower oval passage might be better. Are the head bolt holes supposed to break into the water jacket? The rather lopsided castings have sat on my desk for several days for ruminations. Some of the unmachined surfaces are going to need attention if the engine is to look anything other than extremely agricultural. They will need sand-blasting to hide the evidence. The barrel and underside of the jacket are hardest to do anything with because the water inlet boss prevents turning. 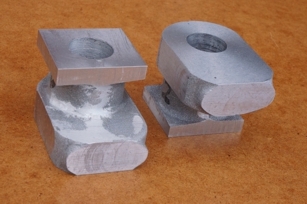 However, because there is some mismatch between the two halves of the castings something will probably need to be done to make the height of the jacket and barrel more equal on both sides. 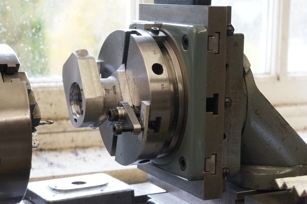 The face under the barrels could be turned part way and continued with a combination of part cuts by hand rocking the chuck and some tickling with a ball-nose end mill. The periphery of the jacket will need fettling, as it is slightly too wide in parts, asymmetrical, and will not match the heads and covers. This may need to be done in stages as the parts emerge. It looks as if it will be best to set up with the bottom face of the water jacket running true to get a cut across the foot. The chucking piece can be cut off with a hacksaw. The casting can then be clamped by the foot to take a good cut across the top. At this stage the plan profiles of the barrel and water jacket can be rationalised to find a centre. The flanks of the jacket could be milled flat at the same time as the bolting flange. This would provide a clearer datum and assure there is sufficient metal each side. Much depends on getting a match for the head and cover, which should also be roughed out. Final profiling would probably be done as an assembly. I find I have come back to the cylinders rather unexpectedly. I wanted to have another go at boring the connecting-rod little ends, but, unsure exactly what diameter to aim for, I want to make the pistons, and to make the pistons I need finished cylinder bores, which in turn need finished cylinders. Another direction would be grinding the cams, but no grinder yet, so here we are. There is still a total of about 1⁄8″ to come off the overall height of the cylinders, with something over 0.050″ to come off the top surface. To start with I took 50 thou off the bottom flanges. No 1 was straightforward. Measurement of No 2 had shown that it needed tilting slightly to level up the unmachined underside of the water jacket, so this was machined with 0.015″ of shim under the valve port end. 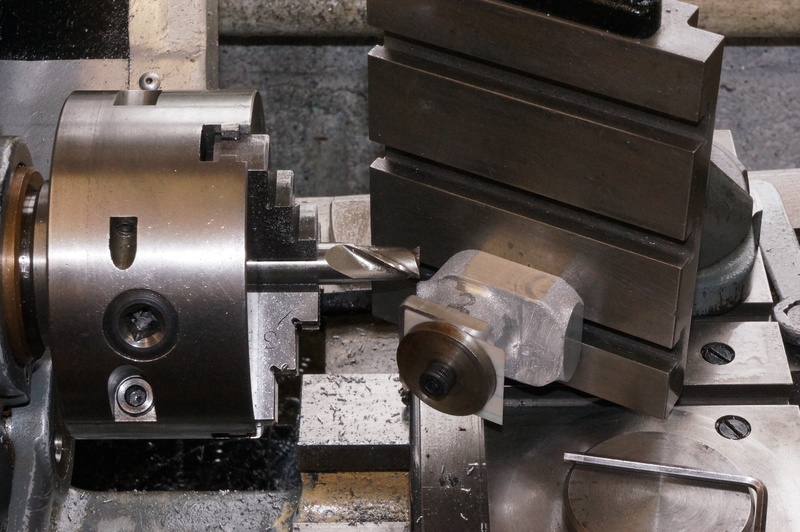 With the top and bottom faces only needing finishing cuts, the next job is to optimise the machining in plan. To do this, initial datum surfaces need to be established. 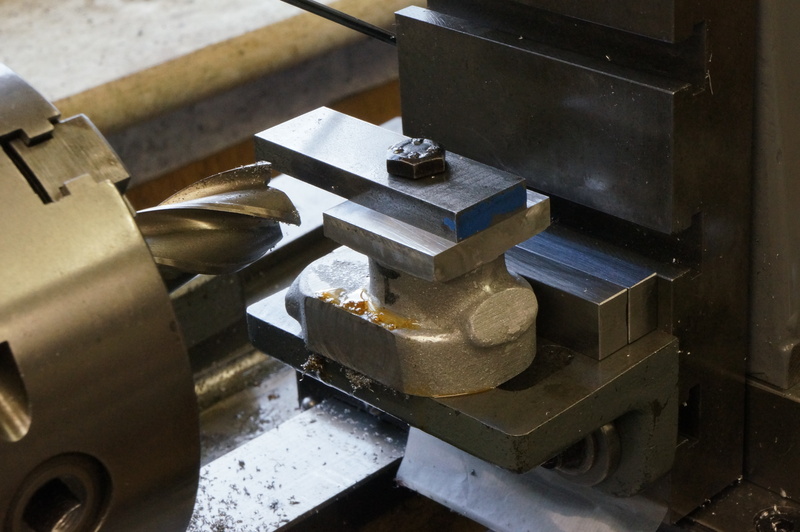 The water jacket is slightly over finished width, so flats can be milled on each side. 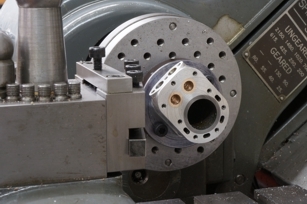 At the same setting, the sides of the mounting flange can be roughed out, 1⁄32″ further in. I took about 0.012″ off the timing side of No 2 water jacket, and just enough to establish a flat on the flywheel side, leaving it about 10 thou over finished width. I treated No 1 cylinder the same. It ended up not quite parallel with at least 0.015″ to take off the foot, while the top has as little as 0.012″ in places. 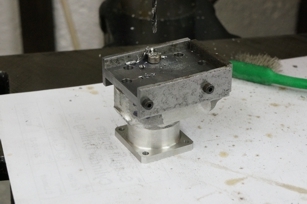 The milling vice is handy, but not ideal for getting the greatest geometrical accuracy. A different set-up will be needed for the finishing cuts. Now to examine the cylinders with the help of the template. No 1 does not present a problem. The cylindrical barrel is accurately centred on the water jacket, and the top surface allows some scope for optimising the endwise positioning. The plan is to take 5 thou off each side and 26 off the port face. One of the potential problems is having enough metal in the cylindrical barrels under the water cooling inlet flange. 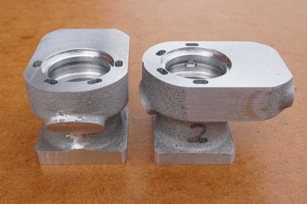 Reducing the amount taken off the port face will help here, and with allowing the rounded part of the water jacket to be profiled. 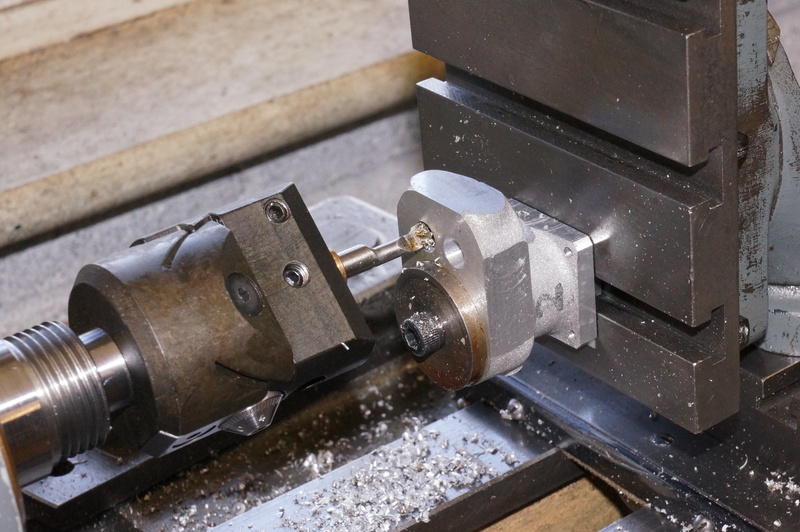 With a flat held against the front face of the mounting flange, a drill can be use to gauge the gap. Coincidentally both cylinders just allow a 2.4 mm (0.092″) drill shank in the gap. 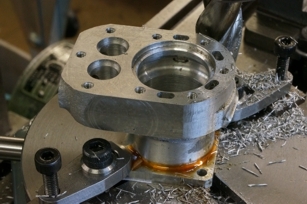 On No 1 cylinder, the flange currently measures 1.180″. Taking 25 thou off the back, and 30 off the front will just do what is needed. Looking now at the sides of No 2 cylinder, The flywheel side of the jacket has a couple of small cavities, so it would be useful if more metal could come off that side. 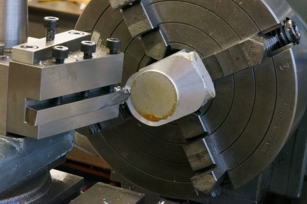 On this casting, that is reinforced as the cylindrical barrel is offset by about 15 thou towards the timing side. 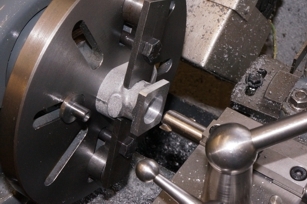 As it has an offset, the cylindrical part of this one is naturally the narrower, at 1.033″ wide, but by turning to 1″ diameter it looks as though it will clean up. With the template on the top surface, it has to be skewed slightly to get a complete fit, and wants a nominal 20 thou off the port face. 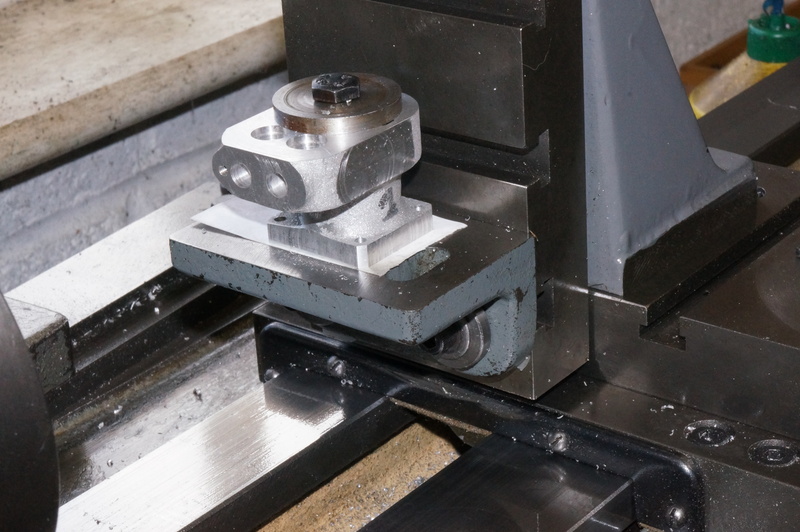 The foot flange is 1.186″ so taking 0.020″ off the back will leave 0.043″ to come off the front. 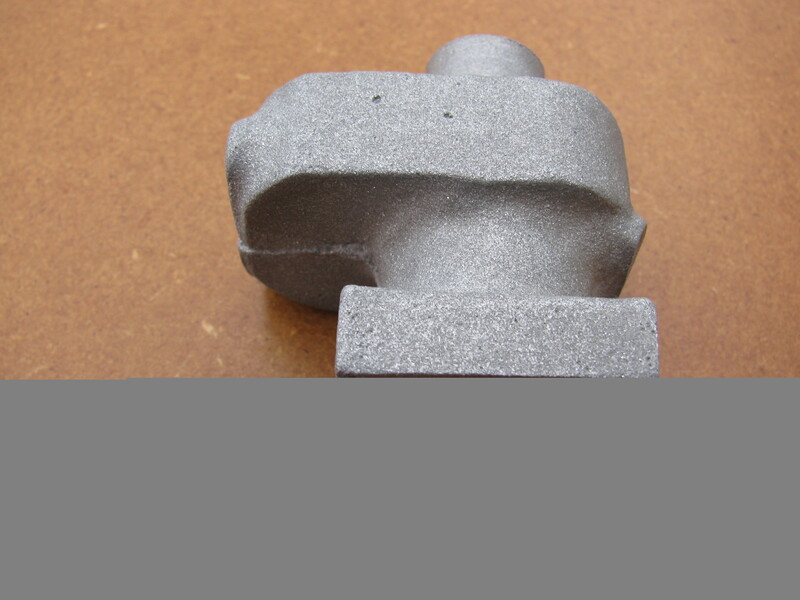 Because the mould halves were offset, this casting needed more initial filing to prepare, and the barrel only has 15 thou to spare front to back. Again, this should just about work out right. 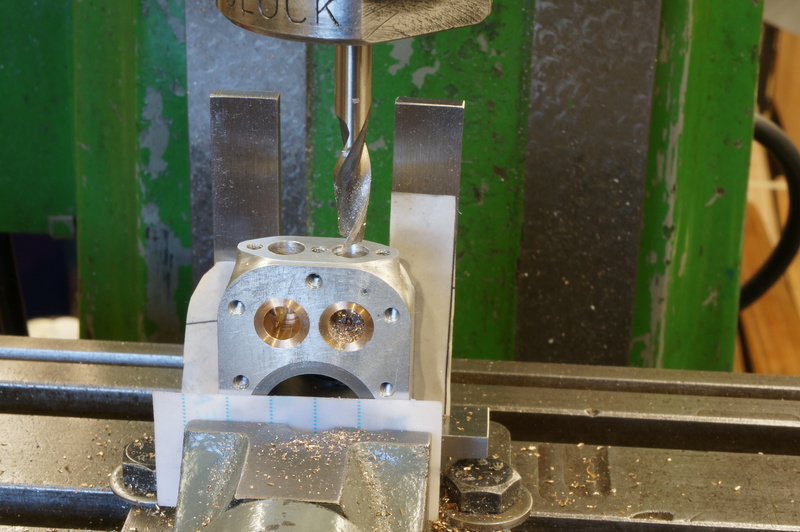 As I have to do a number of set-up changes, and only need light cuts, it will be OK to use the 3-jaw chuck to hold the milling cutter. I started out with the same 9⁄16″ cutter as the best for the job even though it is no-longer dead sharp. With the first cut, on the timing side of No 2 jacket, it is clear it not cutting well. However, the side of the foot has to be done at the same setting, with 1⁄32″ feed from the leadscrew handwheel. Using a ¾″ cutter instead, I milled the other side. The jacket came out well, at +0.0015″. Oddly the foot is slightly tapered and the finish a bit lumpy from the dull cutter. This is no great problem as I will be using the side of the jacket as the datum, and the foot will be finished and sand-blasted anyway. 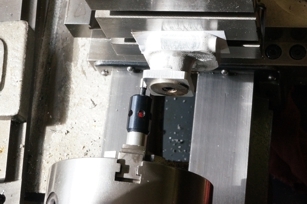 At a third setting, and after squaring off the port face and checking again with the template, it needs a further 0.014″ cut to finish. The back of the flange was finished at the same setting. Finally it was turned to finish the front of the flange, taking 0.043″ off, and then a finishing cut of 3 thou to leave the foot +0.001″. With the flange machined, I again used a flat and probing rods to check the barrel. It will clean-up to 1″ diameter. With No 1 cylinder set up, I took 5 thou off the flywheel side, leaving 7 thou for the other side. 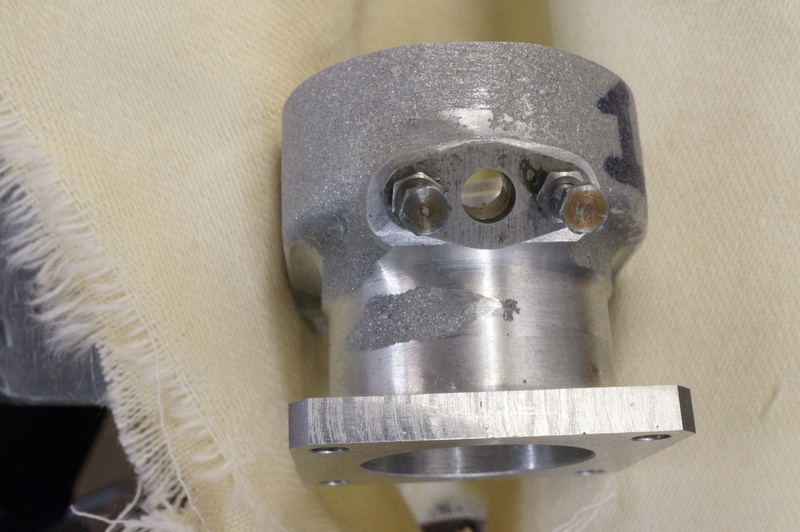 This left the jacket +0.0025″ and the flange +0.001″, both parallel. 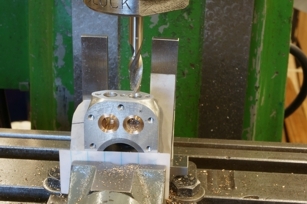 Checking the top face again with the template, anything between 0.005″ and 0.027″ could be taken off the port face. 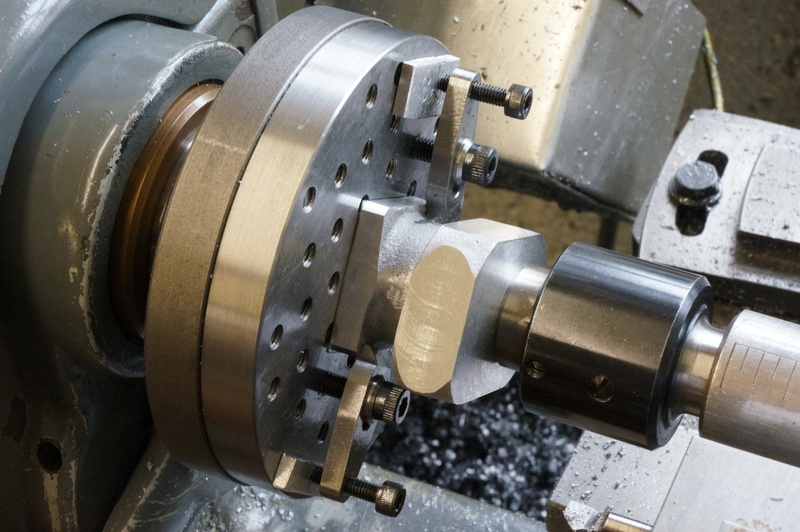 Considering the top faces of the cylinders, I need to leave an allowance of 0.003″ oversize, 0.001″ for lapping; and finish facing cuts over the tops of assembled barrel, liner and valve seats of, say, 0.005″ and 0.002″ or at least 0.011″ in all. 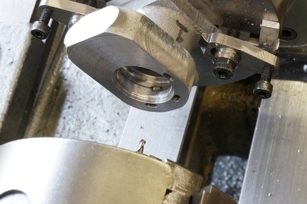 Measuring up No 1 cylinder, the thinnest part of the water jacket allows just that much, and the overall height is 0.031″ thou over the nominal 1.25″, so there is exactly 0.020″ to be taken off the bottom for finishing. As the depth micrometer is reading slightly off, I want to end up with a height measurement off the faceplate of 1.262″. The top is not finished so softening is not needed. I had quite a fight to get the bolting flange running true, but eventually got both pairs of opposite sides within 0.0005″. 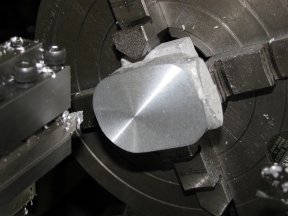 With a freshly honed tool, I took facing cuts of 15 and 4 thou at 850 rpm to get the required height. 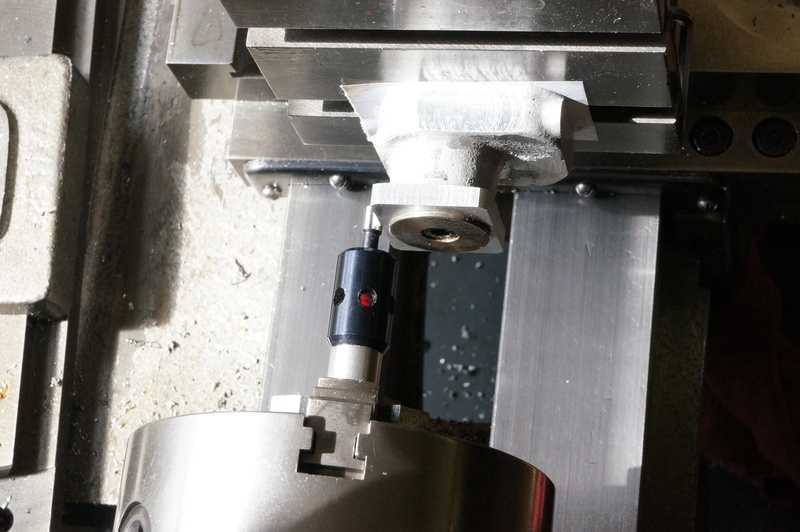 I turned a total of 0.045″ off the corners of the flange to reduce the amount of work that will be needed to file the radii. For finishing the bore I used the ½″ boring bar at 850 rpm. After a trueing cut, I took a further three cuts of 20 thou. The surface finish is not bad, certainly good enough for Loctite. Mercifully, it is also pretty accurately parallel. 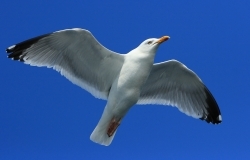 Measured 0.783″. With a further 28 thou to go on diameter, I took a cut of 10 thou. Measured 0.8027″. 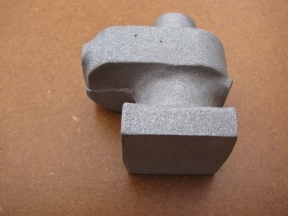 A 3 thou cut, trying a smear of the Rocol RTD I am finding so useful on these castings. In this case it was no improvement on my usual 50/50 mix of neat cutting oil and paraffin. 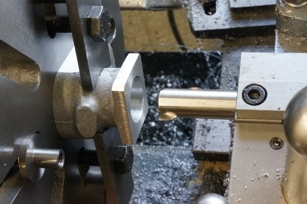 Measured 0.8093″ After a 1 thou cut, I measured 0.811 over the telescopic gauge, and the plug gauge, made initially for boring the crankcase, will not enter the hole. 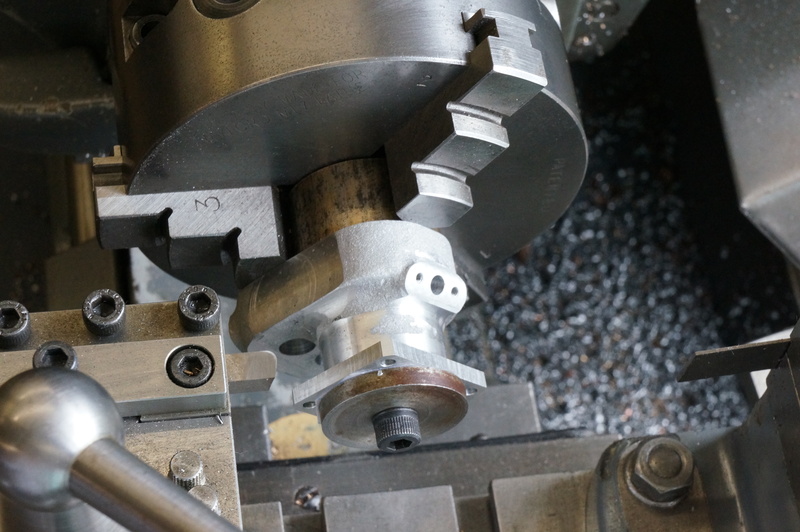 Another 1 thou cut should make the hole 0.0005″ over the nominal 13⁄16″, which is what we want. Take a final thou. The plug gauge fits without tightness or shake, and the telescopic gauge measures 0.8128″, which is spot-on. 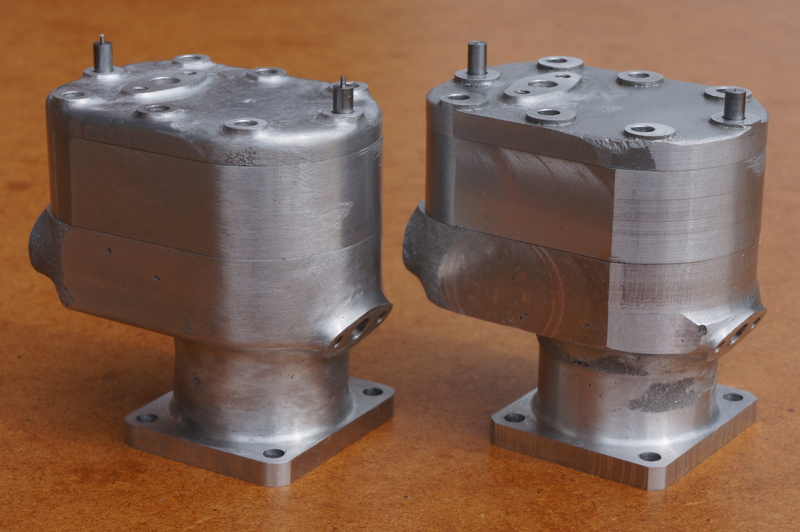 The top and bottom faces of this casting are not perfectly parallel, but it is at least 0.032″ over nominal size. The casing around the valves is at least 0.522′ thick. Taking 11 thou off the bottom will leave the top with the same 11 thou as No 1, and an extra 10 thou. 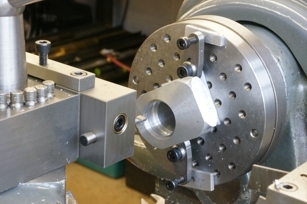 After facing the flange, the height should be 1.271″ or a depth micrometer measurement of 1.272. Setting this one true on the faceplate went much more easily. Three successively smaller cuts off the face brought it to the required size. Turning cuts of 30 and 15 thou truncated the corners. Boring was done as for No 1, with a 25 thou truing cut, 3 of 20 thou, then 10, 5, and 2-and-a-bit thou for a measured diameter of 0.8117″ and a plug gauge that almost starts in. After a final ½ thou cut, the plug gauge says we are good and the telescopic gauge measures 0.8128″. Wow - the bores are interchangeable. In my questionable wisdom I have decided that I did not want the cylinder head bolt holes to break into the water space. This involves a reduced depth of the recess at the top, and I have drawn a 45° transition between the two diameters. As the recess results in a wall thickness at the bottom of the jacket that is quite a bit thinner than elsewhere on the casting, I have shown a generous root radius to compensate. 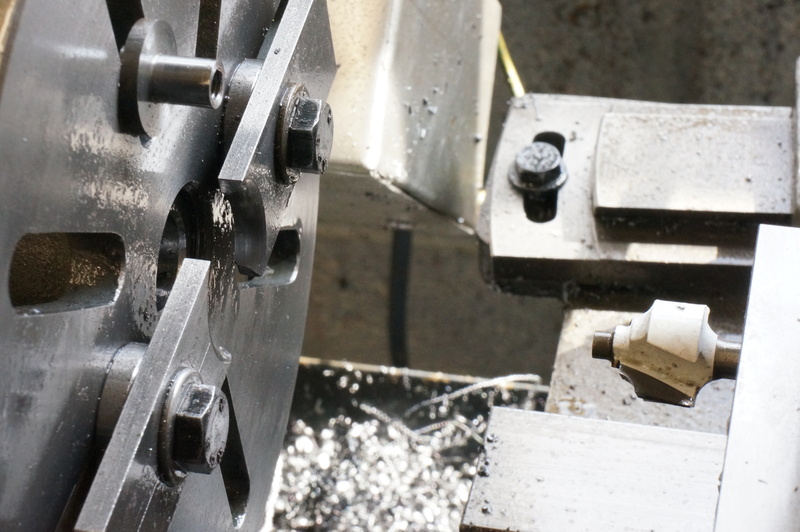 The first job was to grind a boring bit with a 1⁄32″ radius for the top of the recess and 1⁄16″ for the bottom. Because of the small footprint of the bolting flange, I decided to use my small faceplate for this set-up. 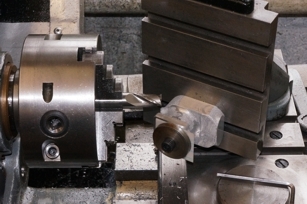 Using a centre in the tailstock allows an initial position to be found quickly. After a bit of a fiddle I got the bore of No 2 cylinder running within 0.0005″. With the top-slide set at 45° for the sloping part, all the boring is done to dial readings on cross and top slide and leadscrew handwheel. This requires good notes on the whiteboard by the lathe, careful zero settings, remembering the directions for backlash, and keeping ones wits, especially allowing for the top face not being to finished size yet. First, the leadscrew dial is set to zero. Next, with the tool touching the face, the top-slide is zeroed, and finally, moving the saddle and cross-slide but not touching the topside, the tool is touched on the bore to set the cross-slide. Now with all dials zeroed the tool is set. The top slide is not touched until the last step of machining the transition slope, anything else would be too confusing. The only difficulty with boring the recess for the shoulder of the liner is to measure the diameter accurately. I used a vernier, but measured over the tips with a micrometer. No 1 cylinder was treated exactly the same. All cuts were taken at a modest 100 rpm (turning the VFD down to 25hz), using the same coolant as before. This produced an excellent finish. 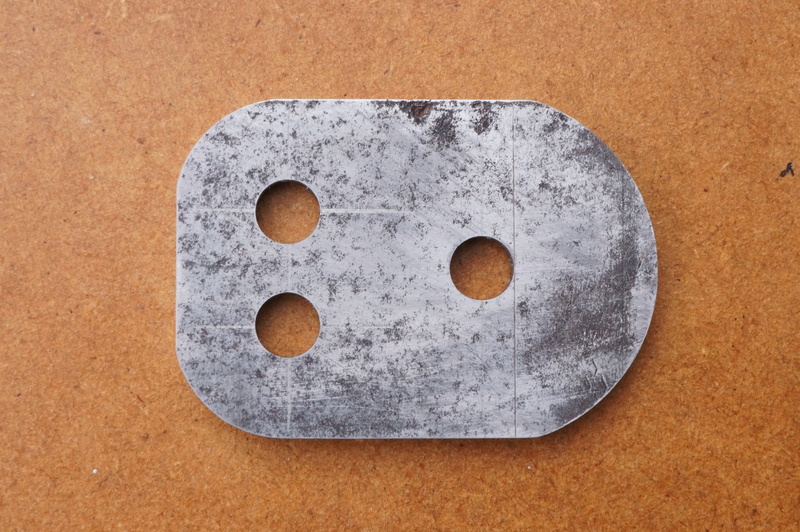 Rather than 1⁄8″ diameter holes, I have decided to make 2.5mm wide slots. These narrower slots save a little of the scant radial space while providing slightly greater flow area. They can be kept just clear of the liner recess. 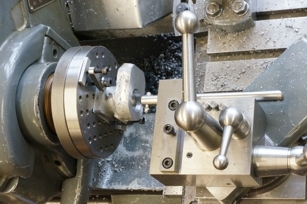 The size is partly determined by the availability of a ball-nose end-mill with adequate reach. With the locating spigot finished I set up for milling the water passages. I set the GHT rotary table square and clocked it on centre by the central hole, and zeroed the dials. With the rotary table locked at a 45° mark, I clamped the No 1 cylinder in place with its sides set vertical. I rotated the table 90° to the horizontal position and again locked it. I lifted the vertical slide 17⁄32″ for the pitch circle radius of the water passages, and backed the cross-slide out by 0.045″ for half the length of the slot (overshooting and winding back for the backlash, as all positions are taken on the infeed). I started by using a No 1 centre-drill and drilling 2mm diameter to 21⁄64″ depth, running the lathe at top speed and 60hz on the VFD (yup, 'overclocking' a Myford). 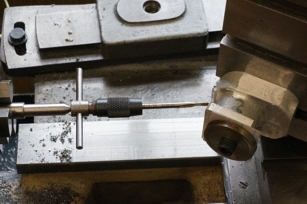 With the cross-slide wound in 0.090″ I drilled a second hole, and then worked between the two positions with a 2.5mm ball-nose cutter, taking about four cuts to finish the holes to the depth of 21⁄64″ (plus the 0.011″ finishing allowance), and then taking a final plunge at each end. I machined the remaining three slots, rotating the table 60° between each, and repeated to process on No 2 cylinder. Where these passages emerge inside, some have not cleared to the top of the water space and most have an unsatisfactory thin edge. I think will need the services of a dentist to improve these. To minimise the amount of hand finishing I have to do on the cylinders, I want to turn as much of the outside of the barrel as possible. This means setting the water inlet flanges as high as the castings will comfortably allow. After doing a bit more filing to clean up the flange profiles, and measuring up the roughed-out flanges, I decide to take another 0.020″ off, and possibly a further 0.010″ if it looks right. Working on No 2 cylinder first, I actually took another 0.027″ off the face, which agrees with my drawing. With No 1 done too, they look fine, and measuring to the top middle of each flange, they are within a gnat's of the same height, and the distance from the port face is about 4 thou different. With these dimensions I adjourned to the computer to update the drawing and calculate a measurable dimension for the hole centreline. I could have used the surface plate to scribe a line at the right height, but the flange faces are finished surfaces and I did not want to mark them. Set up yet again on the slewed slide, I set my 'sticky pin' running true in the chuck and used my headband magnifier to line up the edge of the foot with the point of the pin. Now that I am starting to lose the close-focus ability that short sight gives, I find magnification increasingly necessary. It was then a simple matter of winding the cross-slide out, by the amount worked out for me by Autosketch, to get the centreline through the flange holes. Drilling the holes in the mounting flanges was straightforward once set up. My LED probe does not run true, so it either has to be adjusted with the Griptru chuck, or as I did in this case, try a few positions to minimise runout and then rotate to find a mid-point. In this case it was only a few thou out, but even so I moved it a quarter turn to get side and top positions. In working from the zero settings, I also needed to remember the each edge of the flange has an extra thou on for finishing. Drilled at 2.9 mm, the cylinders sit nicely on the crankcase studs but they are a shade off square so they will need opening out a bit more. Westbury says these should have a reasonable amount of clearance to allow the manifold to line the cylinders up. Incidentally, the washer with the recessed cap-head, used here to clamp the cylinder, has been in the special washers box for over 30 years. It was originally made for boring the arms of the Universal Pillar Tool. In a short session today I set up No 1 cylinder to drill the ports and manifold stud holes. It took a while to get the cylinder square. Sometimes it does, and sometimes it is easy, with no particular reason I can see. Today, holes centre drilled, drilled 6.25mm and finished with a 1/4″ drill, were actually undersize. An exact ¼″ ground pin would not go in the holes. After the valve guides are fitted, perhaps I should polish the ports! Today I drilled and tapped the remaining two stud holes in No 1 Cylinder, and then completed No 2, which clocked up square more easily this time. I used a convenient stub of brass to make a short, shouldered stub mandrel to carry the cylinders for turning the top face of the bolting flange, and as much of the barrel as possible. 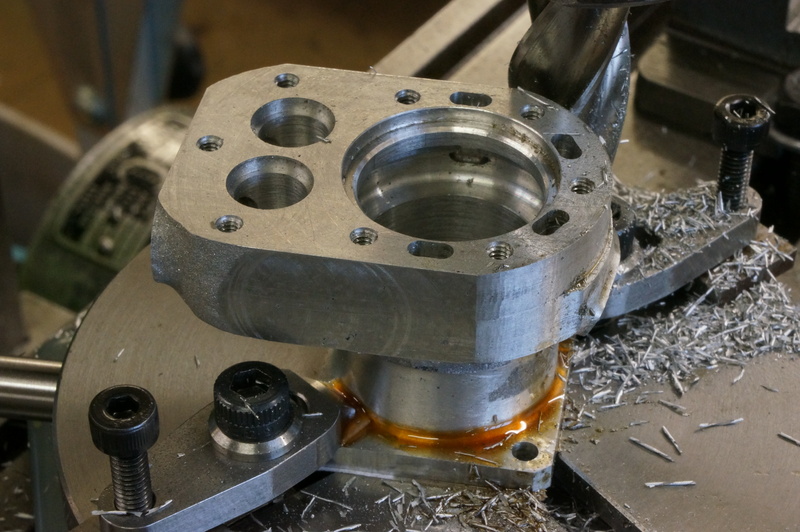 Starting with No 1 cylinder, I turned the flange to thickness and the barrel to 1.020″ diameter, then, changing to a right-hand tool, up to 39⁄64″ from the bottom, which marks the lowest point on the finished water inlet flange. Tools with suitable radii were used. After sharpening my 2.2mm drill using the newly made DAG Brown pattern Small Drill Sharpening Jig, I used the drilling jig in the pillar drill to produce the holes for the head bolts. I set the depth stop to bring the drill tip 1″ clear of the table, so that the holes would finish up the correct depth, however much has yet to be faced off the top surfaces of the cylinders. I found it necessary to take the ¼″ depth of the holes in 1⁄16″ pecks, to clear the chips out of the drilling bush, otherwise they would jam and start turning the bush, which in any case I had to hold in place with a finger nail. I drilled both cylinders to tapping size then changed drill and bush to make the little counterbores, again setting the drill point distance from the table. Using mainly a carbide burr in the Dremel, a round riffler and wet-or-dry paper I worked on the water flange profile on No 1 cylinder. It is not finished yet, but the general shape of the water jacket needs to be worked up first. Working on No 2 cylinder, now the general shape is close to finished size, I could make more progress with hand finishing the water inlet flange, and started work on the internal and external shoulder radii where the round barrel meets the water jacket. 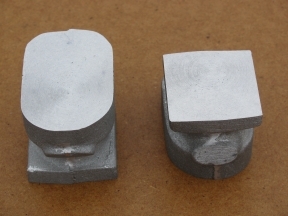 I made some hardened 6BA filing buttons, two at ¼″ and two at 0.230″ diameter. The larger will be used for the cylinder bolting flanges, and the smaller for the cylinder covers, among other things. I also made a fitted screw to locate the buttons more accurately where 0.116″ diameter clearance holes have been used. 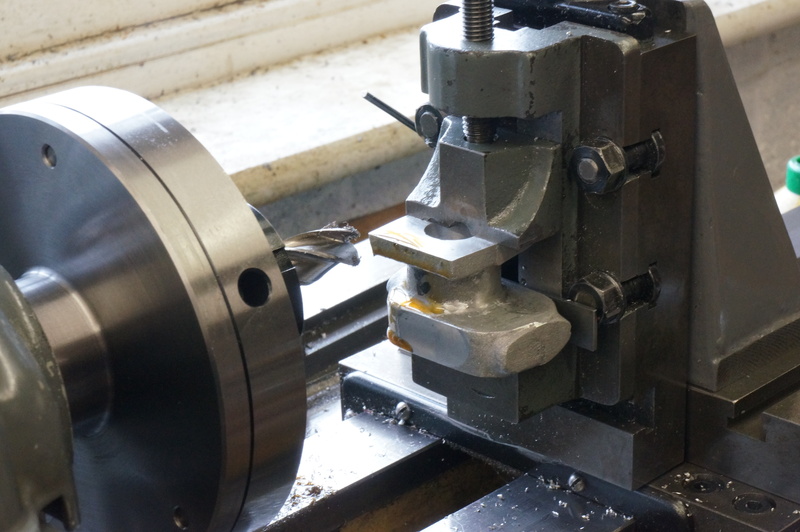 I continued with No 2 cylinder, but after an hour and a half of this close work I wanted a change of job and started work on a gauge for a 7⁄16″ blend radius for the join between the flat sides and the machined arc of the water jacket. I cut out and drilled the gauge blank and drilled & tapped an alloy block to mount the gauge on for milling. While making the gauge, I knocked the RTD bottle of the mill table and broke the spout off the cap. There was an interlude while I made a replacement. With some more work today, mainly refining the blend under the water inlet flange, No 1 cylinder is at last finally fettled, I think. There are sharp edges internally where the vertical water passages cut through into the annular water space round the liner. They are difficult to get at, but I was able to do some trimming with the point of a riffler, being very careful not to scratch the machined surfaces. Working on both cylinders. With the liners in, and finish lapped yesterday, the next job is to fit the valve guides. All parts were cleaned with Loctite 7063, and the guides fixed in with Loctite 648 as before, allowed to cure, and any remaining liquid cleaned off. Clocking up No 1 cylinder for drilling the port through is not easy because the the port drilled in the cylinder is rather rough. 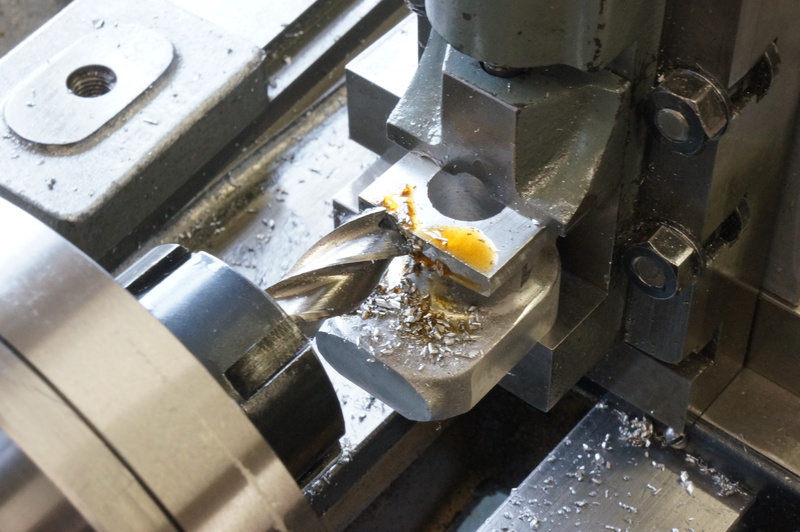 I started with the inlet side, using a centre drill, a 5mm drill, and finishing with a ¼″ ball-nosed slot drill. 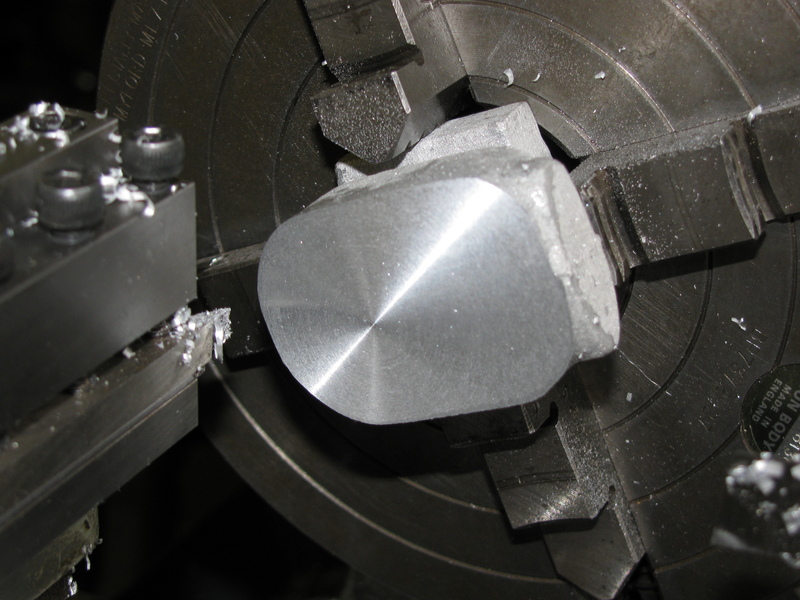 Because of the offset cutting forces the cutter has wandered, making the hole oval, to a maximum of about 0.012″ oversize. This is irritating but not a disaster. I need to think of a better way to do the other holes. While pondering, I deburred the hole. This was not easy because it is difficult to get at, the bronze is tough, and on no account can the valve seat or guide bore be damaged. I faced a slice of 2¼″ mild steel bar to about 3⁄8″ to make a mounting plate for the next job, which will be facing off the top of the assembly. 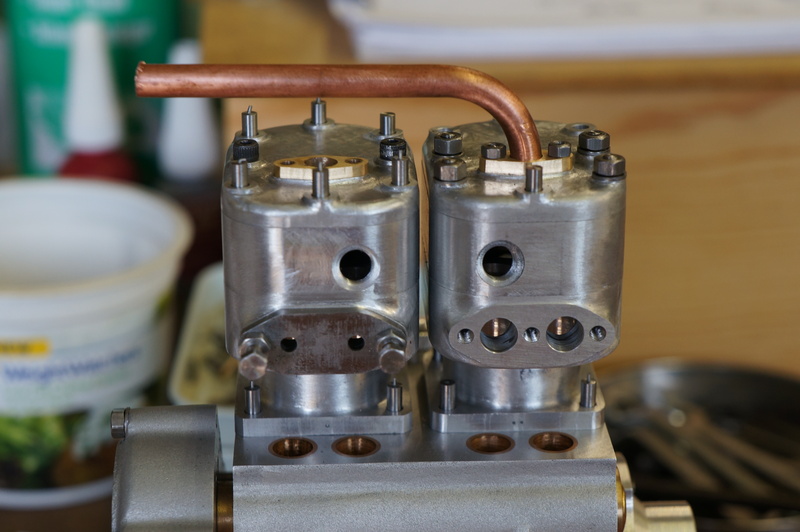 Westbury notes that the cylinders need to have a little play on the mounting studs on the crankcase, to allow them to bolt up tight to the manfold. Both cylinders needed one hole easing out to 3.1 mm before they would sit home with a little play detectable on the studs. Coincidentally it was the same hole on both cylinders. I completed the mounting plate today by boring it to take the projecting bottom ends of the cylinder liners and drilling a tapping the bolt holes. The inlet port, however, was a long way from round and difficult to clock up. I filed a shade off the diameter of a stub of ¼″ brass rod until it would fit in the hole, and then clocked from that. I soon got it to 0.01mm TIR, and drilled and milled the port as before. Deburring again took time and care. With No.1 cylinder mounted on the small faceplate using the prepared plate, and a freshly honed tool, I faced the liner and valve cages flush, and then took cuts of 0.006″ & 0.002″ to finish, noting the reading on the topslide dial. Remembering to leave the saddle locked, I swapped cylinders on the jig plate and faced No.2, to the same setting for the final cut. Everything is now ready for bead blasting.